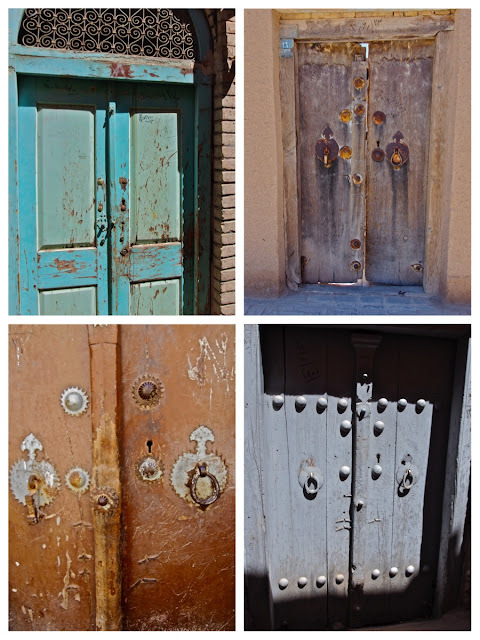 Alternate title for this post: all the pictures in Iran that didn't fit into another blog post. Let's be real: most of Iran is desert. But the desert is not nearly as homogeneous as you might expect - there is semi-arid desert with brush and sparse trees; there are high mountains and empty salt lakes; there are cities rising up out of the sand, built from the desert itself. Even though I am a lover of all things lush and green, I was never, ever bored of the desert. Thunderstorm rolling into the city from the mountains north of Tehran. My first night in Iran. The inhabitants of the desert city of Yazd have found ways to survive there for over 5,000 years. Ancient Yazdians constructed their homes out of mud bricks; used complicated systems to bring water down from underwater mountain springs; built wind towers to cool their homes in the summer; and even found ways to make ice from the cold winter months last through the heat of the summer. 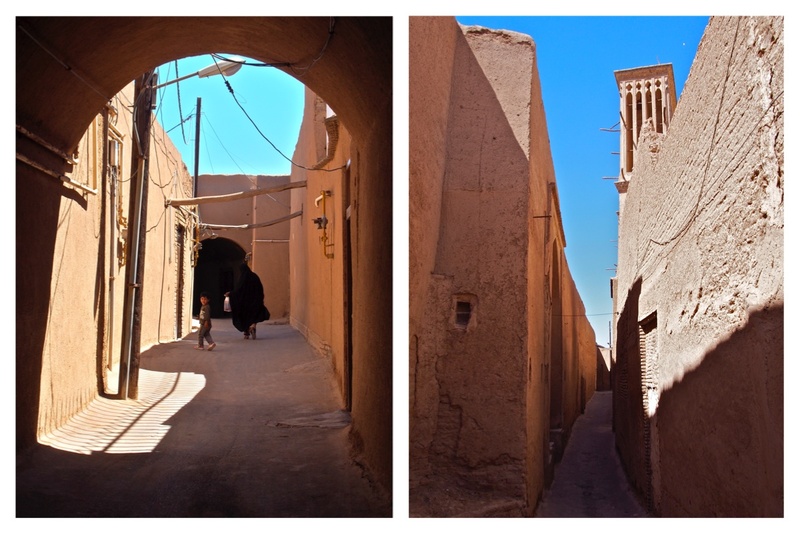 While most residents have now moved to newer parts of the city and use modern technology to make ice and cool their homes, the Old City of Yazd gives visitors a chance to appreciate the ingenuity of ancient desert dwellers. The older doors have two knockers - one for male visitors, one for female. They make different sounds, so that women inside know if they need to put on a head scarf before they answer the door. 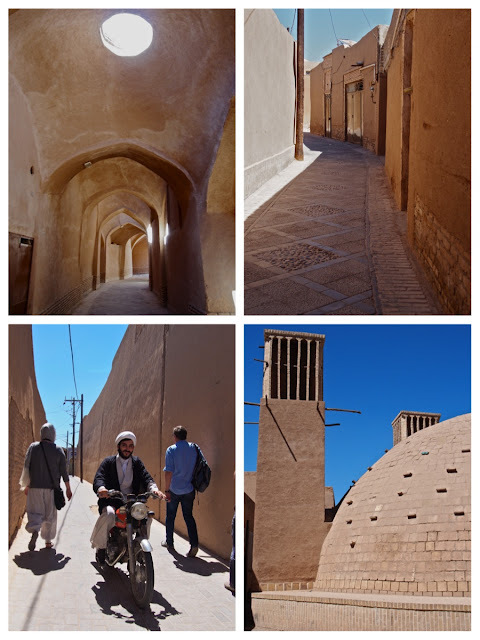 Tunnels to keep out of the sun; narrow, shaded streets; wind towers attached to a water storage tank; imam on a motorbike. The followers of the ancient Zoroastrian religion did not believe in burial or cremation, because they believe it contaminated the earth and fire, elements that they consider holy. So instead the used these Towers of Silence (doesn't that sound ominous) to dispose of the dead. Bodies were placed inside the open-topped towers to be eaten by vultures. 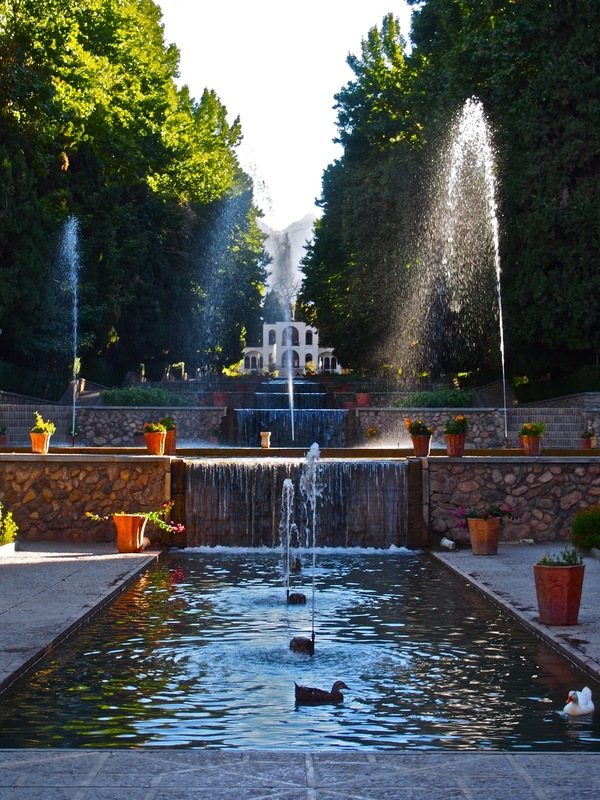 These gardens, which as a group have been named a UNESCO World Heritage Site, date back to the 6th century BC. They were meant to symbolize Eden, and always include the four Zoroastrian elements of sky, earth, water and plants. Under the shade of towering green trees, you completely forget that you are in the middle of the desert. Doesn't look like a desert, does it? This lady is apropos of nothing, but I saw her sitting at one of the gardens and just loved her. Judith and Cecelia with new friends at one of the gardens. These inland salt lakes used to fill up seasonally with water, but lately most of them stay dry year round due to increased upstream water use and drought. There are industrial salt harvesting sites set up, but we also saw people pull off the road, scrape up some salt for home, and drive away! While this looks like solid ground, and in fact I saw a Jeep parked out in the middle of one, when I stepped off the raised path onto the lake bed to get a better picture, I cracked the surface and sank ankle deep into extremely salty water. It was a long walk back to the bus with a wet, crusty shoe.